International influence has long been prevalent in Tianjin since the mid-1800s, resulting in a myriad of concrete colonial influences across the city. Fortunately, dozens of these colonial sites still remain in near-pristine condition today. Some on this list you’ve likely heard of, and others you’ve yet to discover. Following the Treaty of Tianjin, which ended the Second Opium War, Anglo-French colonialists reshaped this northeastern city into a pinnacle trade port. Since then, overseas cultural infusion lasted all the way until World War II. Tianjin was home to some of China’s first Western ideal institutions, like art galleries, ballrooms, lounges, nightclubs, cinemas, and theaters. Boasting an illustrious history of over 150 years, The Astor was one of the very first hotels built in China. It was converted into a museum, still highly resembles its past, and is arguably one of the most intriguing colonial sites in Tianjin. It was initially built by a British Methodist missionary in 1863. The hotel, in its glory days, hosted world famous celebrities of its era, including American presidents and European investors. The museum is located in the basement of the new Astor Hotel. On display are artifacts of the old hotel such as artwork, gramophones and luxury antiques of the bygone era. The British colonial former Tianjin Race Club (also known as the New British Club) was built in 1925. With a perfectly symmetrical red brick exterior, this two-story club housed numerous recreational facilities including bowling allies, an indoor swimming pool, a library, a theater, and a ballroom. Surrounded by a wondrous landscape of pastoral gardens, this club was exclusive to aristocratic foreigners until the Japanese took control of it in 1941. It was later turned over to American forces after the Japanese surrender in 1945, at the end of World War II. The former American Navy Club was constructed in 1924 and served as an entertainment venue for soldiers. It was equipped with a cafe, bar, billiard rooms, restaurants, a casino, and a ballroom. The building was last used to house American soldiers following their 1945 WWII victory. With beautifully decorated arches and a wide-stretching balcony, this classical-themed building is now used as office space. The Five Great Avenues was among the most affluent areas to attract colonialists in the 20th century. A truly spectacular cityscape within Tianjin, this giant pentagon-shaped compound houses over 230 buildings. Its architecture is inspired by the West, including Germany, Italy, France, Britain, and Spain, with styles from the Renaissance to the Victorian era. Today it’s a top tourist destination that truly showcases the city’s charm and history. Among Tianjin’s very first colonial-era facilities was The British Ballroom, also known as The Club. Opened and funded in 1860 by the early immigrants of the British Concession, The British Ballroom served as an entertainment venue for its immigrants. It held all sorts of musical spectacles, tea parties, and social events. Reconstructed in 1904, the building houses massive window columns and exudes aspects the Victorian era of the late 1800s. Tianjin’s version of Little Italy is the Italian Concession, which was built in 1902. Today it stands as a tourist sensation because of its numerous celebrity residences, chic bars, European-style restaurants, art galleries and gelato shops. At the center of the block is Marco Polo Square, and many intact fences and old-fashioned buildings still exude an Italian air. Aside from the street shopping and food, enjoy Italian performances, fashion, and other exhibitions along your journey. The Former Jaialai Sportscenter was once the largest gambling house, lounge, and dining hall in Northern China. Built in 1934, the center was co-designed by an Italian and a Swiss architect. In 1942, the Swiss took over the center, but after the Chinese Revolution the Jaialai Sportscenter was rebuilt into the Workers’ Club. Now it is used for business. When you step outside the train station, the Haihe Cultural Square will be the first thing to inspire you. Save this site for nighttime to get the total feel of awe, as the Square is riverside and completely transformed when illuminated. You can even take a boat ride to see it. This revamped historical area has one magnificent skyline, with an eclectic share of classic European and Western architectural buildings. 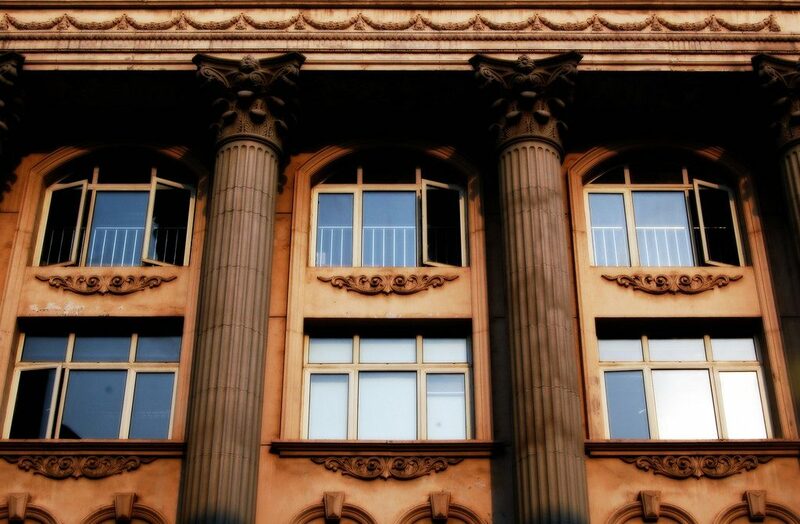 Representing Russian interest in China from the Qing Dynasty up until the Chinese Revolution, this foriegn bank was created with French and Russian funds and opened in Tianjin in 1910. Today the building is used by The People’s Bank of China. This two-storied brick and wood structure was designed in typical classical Russian style. The interior wooden decor is well preserved and is as elegant indoors as its exterior. Following the Japanese occupation of Tianjin in 1941, this building served as a multi-use pavilion for housing both Japanese soldiers and Japanese employees. It was also a place for them to practice martial arts, Judo, fencing, and boxing. The pavilion’s first floor featured apartment-style rooms and the second floor was designated as a recreational facility. This Japanese-style spacious structure was made of wood and brick, with a sloping tile roof. The most prominent European colonial religious structure in Tianjin, and largest church in north China, is XiKai Church, also known St. Joseph’s Church. Located downtown, this cathedral was built in 1916 with imported bricks from France. Its interior pastel walls convey its Neo-Byzantine style, along with a plethora of art, statues, and paintings. Of both French and Roman influences, Xikai is the pinnacle Catholic church. Xikai is still much alive today with bilingual masses every Sunday. Club Concordia was built in 1907 and was also known as The German Club. Mainly serving as a venue for political, recreational, and social activities for German colonists, the term “Concordia” is inscribed into the second floor. The word means “for all people joining for a common purpose.” This elegant, three-story brick building portrays the architecture of its Nordic inspiration.